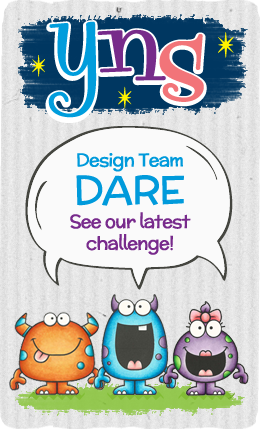 The DT Dare Challenge this month is FLORAL!! The design team was asked to create a project using anything floral (pattern paper, embellishments, etc.). 2. I cut the Simple Stories Summer Vibes pattern paper to 4.25 x 5.50 and used Your Next Stamp Scrapworks-Mini Sunburst Die Set to cut a flower in the center of the paper. 3. I used the pattern paper as a guide to draw a light flower on my card panel where I want my swing for the bear to appear. 4. I used the Misti and stamped the swing stamp where I wanted it. I erased the pencil mark. 5. I stamped the sentiment from the Words Critters – Exotic Animal Stamp Set with My Favorite Things Hybrid Ink. 6. I adhered the pattern paper to the card base using foam adhesive. 7. I colored my bear with Copic Markers: black, BG34, E13, R20. 8. I adhered my bear on top of the swing using foam adhesive. So tell me did I live up to the challenge? I would love to know, let me know below! Just a reminder….we have a New Release Sale!!! Please go to YNS blog and leave a comment to WIN a YNS Stamp Set of your choice!! Contest ends July 10th at midnight EST. The winner will be announced on July 12th on the YNS blog!! Oh my! That is TOOO Sweet! What a darling baby card. Love it! Such a cute card. Really like the cutout. Definetly lies up to the challenge!! Your card is so sweet!!! Congratulations on being chosen a DT member!!! !